Jerry Reed Hubbard, known professionally as Jerry Reed, was an American country music singer, country guitarist, session musician, songwriter, and actor who appeared in more than a dozen films. Known in country music as "The Guitar Man," singer-songwriter Jerry Reed gained recognition not only for a successful solo career but also as an actor and ace session player. 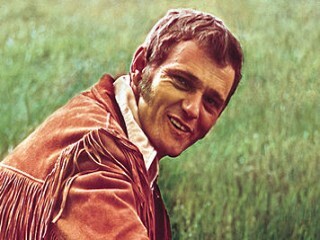 Jerry Reed Hubbard was born in Atlanta on March 20, 1937. He was signed by publisher and producer Bill Lowery to cut his first record, "If the Good Lord's Willing and the Creeks Don't Rise," at age 18. He continued releasing both country and rockabilly singles to little notice until rocker Gene Vincent covered his "Crazy Legs" in 1958. After a two-year tenure in the military, Reed moved to Nashville in 1961 to continue his songwriting career, which had continued to gather steam even as he was in the armed forces thanks to Brenda Lee's 1960 cover of his "That's All You Got to Do." He also became a popular session and tour guitarist. In 1962, he scored some success with the singles "Goodnight Irene" and "Hully Gully Guitar," which found their way to Chet Atkins, who produced Reed's 1965 "If I Don't Live Up to It." In 1967, he notched his first chart hit with "Guitar Man," which Elvis Presley soon covered. After Presley recorded another of Reed's songs, "U.S. Male," the songwriter recorded an Elvis tribute, "Tupelo Mississippi Flash," which proved to be his first Top 20 hit. After releasing the 1970 crossover hit "Amos Moses," a hybrid of rock, country and Cajun styles, Reed teamed with Atkins for the duet LP Me and Jerry. During the 1970 television season, he was a regular on the Glen Campbell Goodtime Hour, and in 1971 he issued his biggest hit, the chart-topper "When You're Hot, You're Hot," which was also the title track of his first solo album. A second collaboration with Atkins, Me and Chet, followed in 1972, as did a series of Top 40 singles, which alternated between frenetic, straightforward country offerings and more pop-flavored, countrypolitan material. A year later, he scored his second No. 1, "Lord, Mr. Ford. In the mid-1970s, Reed's recording career began to take a backseat to his acting aspirations, and in 1974, he co-starred with his close friend Burt Reynolds in the film W.W. and the Dixie Dancekings. While he continued to record throughout the decade, his greatest visibility was as a motion picture star, almost always in tandem with headliner Reynolds. After 1976's Gator, Reed appeared in 1978's High Ballin' and 1979's Hot Stuff. He also co-starred in all three of the Smokey and the Bandit films. The first, which premiered in 1977, landed Reed a No. 2 hit with the soundtrack's "East Bound and Down." In 1979, he released a record comprised of both vocal and instrumental selections, Half & Half. It was followed two years later by Jerry Reed Sings Jim Croce. In 1982, Reed's career as a singles artist was revitalized by the chart-topping novelty hit, "She Got the Goldmine (I Got the Shaft)," followed by "The Bird," which peaked at No. 2. His last chart hit, "I'm a Slave," appeared in 1983. After an unsuccessful 1986 LP, Lookin' at You, Reed focused on touring until 1992, when he and Atkins reunited for the album Sneakin' Around before he again returned to the road. Reed released a live album in 2005. Reed died Aug. 31, 2008, at the age of 71. View the full website biography of Jerry Reed.